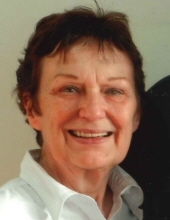 Tamara Rose “Tammy” Ferron, 75, Green Bay, died Monday, April 8, 2019 at St. Mary’s Hospital. She was born on January 26, 1944 to Jules Barber and Margaret (Gritt) Stamps. She married Roland Ferron Jr. on May 25, 1962. They had three children, Vicky (LeRoy Jr.) Vanden Avond, Valerie (John) Frederick and Vance Ferron. Tammy was the best person ever put on earth. She’ll be terribly missed. Per Tammy’s wishes, there will be no services. A great thank you goes to everyone at St. Mary’s Hospital who helped Tammy in her time of need. To send flowers or a remembrance gift to the family of Tammy Ferron, please visit our Tribute Store. "Email Address" would like to share the life celebration of Tammy Ferron. Click on the "link" to go to share a favorite memory or leave a condolence message for the family.